This past Thanksgiving, just a few weeks ago, I traveled out of state to spent the holiday with family. There were 19 of us around the Thanksgiving dinner table. We enjoyed a traditional feast, with turkey, dressing, potatoes, sweet potatoes, green bean casserole and pie. Lots of pie. There four or five pumpkin pies, a chocolate pie, even a mince pie. But only a single apple pie. If my grandmother was still alive that pie line up would have a few more apple pies. Grandma made the best apple pies I’ve ever eaten. Apple is about my favorite variety of pie even today, though I have yet to find one quite as delicious as those my grandmother used to make. The closest I’ve come isn’t actually a pie. It’s one of the newest flavors of ejuice from VaporFi, who have teamed up again with the mixologists at Cosmic Fog to present Grandma’s Dutch Apple. Apple is pretty popular ejuice flavor, and most ejuice makers have at least one variety and most are pretty authentic. Apple pie ejuice is another matter altogether. VaporFi’s Grandma’s Dutch Apple Pie ejuice manages to get not only the apple part right but the pie element as well. On the inhale there’s the unmistakable flavor of slightly sweet, slightly tangy apples that have baked in their own juices. That’s quickly joined by the delicate note of made from scratch pie crust dusted lightly with sugar and maybe a pinch of cinnamon. On the exhale the sweet apple remains along with the crust taste that lingers just a little. The vapor leans to the warm side and the throat hit is mild. Grandma’s Dutch Apple Pie has the aroma of hot pie that’s just been taken from the oven and set out to cool. I vaped Grandma’s Dutch Apple Pie for a couple of days and found myself wishing I had taken it with me on my Thanksgiving road trip, what with the scarcity of apple pie there. This is a delightful, authentic tasting ejuice. Fans of apple and pastry flavored ejuices are going to really enjoy it. VaporFi offers Grandma’s Dutch Apple Pie in 30 ml glass dripper bottles for $17.99. 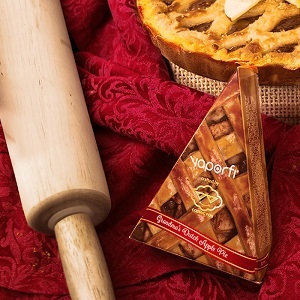 Available nicotine levels are 0 MG, 3 MG, 6 MG and 12 MG. Grandma’s Dutch Apple Pie is mixed in Max VG PG/VG ratio. I vaped Grandma’s Dutch Apple Pie, crafted by Cosmic Fog, in a SMOK TFV8 tank on a VaporFi VEX 150 TC. VaporFi provided the bottle of Grandma’s Dutch Apple Pie for the purpose of this review and they’re a Seven Report advertiser. 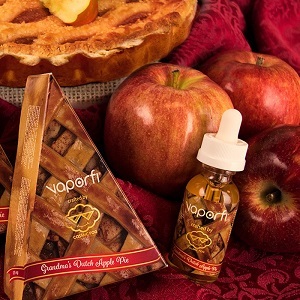 Order Grandma’s Dutch Apple Pie, crafted by Cosmic Fog, from VaporFi.